Theater as a whole is starting to come around on sci-fi and fantasy. And while that might put it about twenty years behind the cultural zeitgeist (can’t wait for that three-part Avengers musical in the 2035 Broadway season), it’s also about dang time. There are new stories to tell, new worlds to conquer. And, besides, there have been so many plays set in the American living room that I’m afraid the furniture’s starting to prolapse. Earlier this season there was the epic Kentucky-fried-Tolkien grandeur of The House Theatre’s “Hammer Trinity” and now Sideshow Theatre Company has brought us Walt McGough’s “Chalk” directed by Megan A. Smith. “Chalk” is the opposite of “The Hammer Trinity” in terms of scale—instead of dragon on zeppelin melees we are given two women in a dilapidated barn—but is its partner in spirit. The fantastical is on hand to illuminate the mundane. A play about an alien invasion is also a play about everyday alienation. The play lifts elements from Brecht’s “Caucasian Chalk Circle,” though it could hardly be called a “reboot.” There is the titular circle made of chalk. There is a country at war. And there is a mother (Kathleen Akerley) and her child (Nina O’Keefe) who may or may not really be her child. 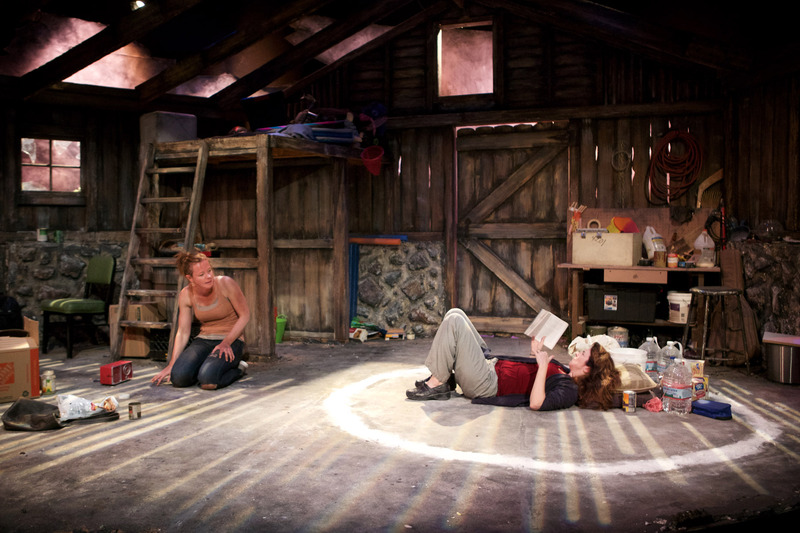 But “Chalk” is very much its own play: a thrilling two-woman tete-a-tete. American plays might be full of mother-daughter showdowns, but very few feature a daughter who wants to literally eat her mother alive. Sideshow Theatre at Victory Gardens Richard Christiansen Theater, 2433 North Lincoln, (773)871-3000, victorygardens.org. $20-$30. Through June 28.